Anne is the mother of five, with never a dull moment in her lively home. And now with a new baby on the way and insufferable Aunt Mary Maria visiting -- and wearing out her welcome -- Anne's life is full to bursting. Still Mrs. Doctor can't think of any place she'd rather be than her own beloved Ingleside. Until the day she begins to worry that her adored Gilbert doesn't love her anymore. How could that be? She may be a little older, but she's still the same irrepressible, irreplaceable redhead -- the wonderful Anne of Green Gables, all grown up. . . She's ready to make her cherished husband fall in love with her all over again! 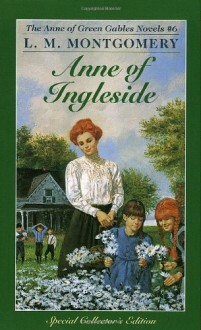 I'm not a fan of Anne, but this was rather enjoyable.